We have a lot of developers who are using JDeveloper to develop applications with Oracle SOA Suite, and in this blog I wanted to show them how the combination of JDeveloper along with Oracle Developer Cloud Service can help automate their whole development and delivery lifecycle. One unique aspect of Developer Cloud Service is that it has an instance of JDeveloper available in the build environment. 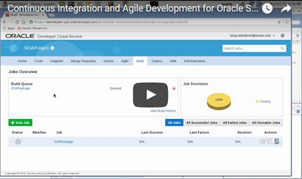 This allows customers who are building Oracle SOA artifacts to leverage the OJDeploy mechanism to package their applications as part of a continuous integration cycle just like they do during development time. With the improved DevCS integration that we added in JDeveloper 12.2.1, developers can go beyond integration with the Git server offered by DevCS and can now interact with the DevCS task tracking system directly as well as associate code changes to specific tasks they are working on.